Place sugar, vanilla and egg yolks in blender. Blend well and add half and half. Add bourbon, brandy and rum. Whip cream and pile on top of eggnog. Dust top with nutmeg and serve. To fill our punchbowl I had to make a double batch. Notes: Some members of the White House Residence staff recommend making the eggnog days in advance and allowing it to rest in the refrigerator until just before serving, to enrich the flavors. Others have suggested the addition of a pint of eggnog ice cream be placed in the punchbowl and allowed to melt into the eggnog as it’s served. I’ve tried letting the eggnog rest for several days and it was even stronger than a freshly-made batch. Adding eggnog ice cream would be fine, as long as it’s a good eggnog ice cream. This recipe contains raw eggs and should not be consumed by pregnant women, or anyone whose health could be compromised. 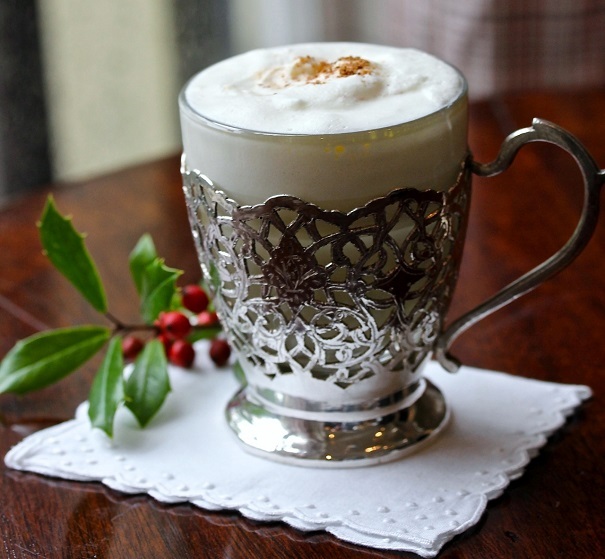 Please post the non-alcohol (nice) egg nog recipe. Thanks for writing in and I hope you enjoy it. That is lovely! I’m so glad you found it! Thanks for writing in and have a very merry Christmas.